New from Z Girls Press: Clyde the Cat That Came In From The Cold by Artist/Author Daphne Stammer for children and A Quick Succession of Busy Nothings by Kate Zarrella. Clyde tells the true story of how a once homeless cat found a home in beautiful, lively illustrations with heartwarming captions. Kate Zarrella has created a captivating adult coloring book featuring a handful of original illustrations plus line art showcasing the wit and wisdom from books by classic novelist Jane Austen. 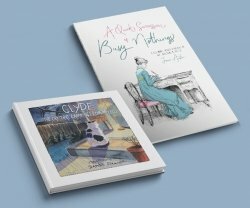 Sacramento, CA, November 14, 2018 –(PR.com)– November is Picture Book Month and Sacramento publisher, Z Girls Press has a few new titles to offer those who love picture books. Stammer wrote and illustrated the story, learned bookbinding, and made her own unique hand-made book twenty-five years ago. Coincidentally she met the Z Girls who fell in love with the story, captured it digitally, and now Clyde is available in hardcover, paperback, and e-book formats wherever you buy books. Shannon in Florida, said, “My girls loved Clyde. He is too cute.” Tania in California said, “What a wonderful story! Many cat lovers can relate as most of us have taken in cats in need of love, shelter, and care.” Stammer plans to donate a portion of proceeds from the sale of Clyde to non-profit organizations that support those who help feral cats. A Quick Succession of Busy Nothings, A Coloring Book Featuring the Wit, Wisdom, & Sass of Jane Austen is the inspired creation of Z Girls Press Creative Director Kate Zarrella. Zarrella has been a fan of Jane Austen’s books since high school, and during an extended stay in London, toured Austen’s House Museum located in the village of Chawton near Alton in Hampshire. Austen’s story is unique for her day as her writing explored the dependence of women on marriage, social standing, and economic security. Hundreds of years laters, those concerns are still valid for many women and Austen’s books are still very popular today. Adult coloring books are a perfect holiday escape for busy women, or a fun activity for get-together’s with friends and family. This book is also available wherever you buy books.